Anise hyssop (botanical name Agastache foeniculum) is a species of perennially growing plant that belongs to the mint family (genus Lamiaceae). Anise hyssop is indigenous to most of the north-central and northern regions of North America. A firmly straight growing perennial plant, anise hyssop usually grows to a height of anything between 0.6 meter and 1.5 meters. Since this herb is very attractive as well as aromatic, anise hyssop is very often grown as a garden plant, where this herb makes an extremely beautiful backdrop plant. Anise hyssop produces sharp, vivid green leaves that are notched at the edges and are swathed with delicate, white, hairs similar to felt on their underside. During the spring, new undergrowths usually have an attractive purple-hued radiation. The aroma as well as the essence of the foliage has a fascinating blend of mint and anise. The stems of anise hyssop are branched and more often than not hairless. The rootstock is branching and produces fibrous roots. The herb produces elongated flower spikes composed on several attractive small lilac-blue flowers during the period between July and September. In addition, a cultivar that bears white flowers is also in existence. Compared to the leaves, the flavor of the flowers is a little dull. In fact, hyssop (Hyssopus) is a genus of about 10 to 12 plant species that are partially woody or herbaceous and indigenous to the region ranging from the east Mediterranean to central Asia. Anise hyssop has been used by North American First Nations people as a breath-freshener, as a tea and as a sweetener. An infusion of the herb was used for chest pains, and the roots were used for coughs. Agastache is used in Chinese prescriptions for heatstroke, headache, fever, and angina. Leaves are used as poultices for sores. It is used in dried flower arrangement, and the essential oils are used in perfumes and aromatherapy. It is also a good source of nectar. 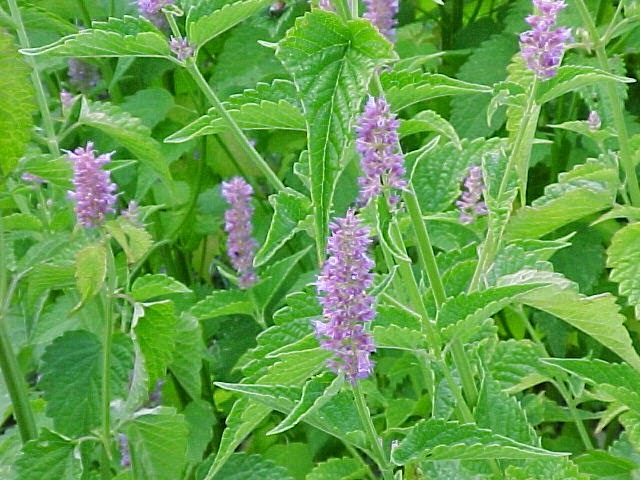 In folk herbal medicine, anise hyssop tea has been employed to facilitate the digestive process. The Native Americans also used anise hyssop as a medication to cure wounds, fevers, diarrhea and cough. The delicately, anise-aromatic leaves are employed in the form of a seasoning, a tea as well as in potpourri. Bees have a preference for the purple hued flower spike of this plant and they prepare a light scented honey from the nectar collected from anise hyssop flowers. The leaves of anise hyssop are cardiac (good for the heart) as well as diaphoretic (induces perspiration). An infusion prepared from anise hyssop leaves is used to cure colds, feeble heart and other health conditions. When the infusion is used in its cold form, it is effective in relieving pains in the chest, for instance, when the lungs are throbbing owing to excessive coughing. A poultice prepared with the leaves and stems of anise hyssop may be used to heal burn injuries. Put fresh or dried anise hyssop leaves in a square of cheesecloth and hang from the tub faucet, letting the water flow over the herbs. The scent from the hyssop will help calm frazzled nerves. Traditionally it was also used for pain relief, so soak those sore muscles in an anise hyssop bath. Anise hyssop is also supposed to stop nightmares. The anise hyssop leaves and flowers make a delicious black licorice flavored tea that also has some medicinal benefits. 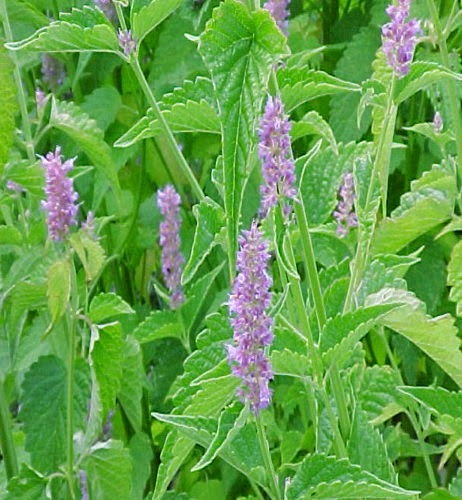 Anise hyssop can helps expel mucus making it ideal for treating colds. Susun Weed, too, suggests that it is good for relieving congestion. To dry, simply hang the stems in a dark place until crispy and then store in airtight containers. Besides, therapeutic uses, anise hyssop is also used for culinary purposes, for instance, you may add fresh leaves and flowers of this plant to salads and fruit salads as well as use it in the form of a garnish. Alternately, you may use fresh or dried up anise hyssop leaves in accompaniment of chicken, lamb, salmon as well as to make some vegetable dishes like peas. Anise hyssop leaves may also act as a substitute of anise or mint in different recipes.